Schwarzbier | Köstritzer Schwarzbierbrauerei GmbH & Co.
First off, it's a European LAGER, not an ale, so it's more mellow and easy to drink. At the same time, it packs a whole lot of flavor. You can drink this one all day, all the time. Dark colour with red tones to the light, medium head with short retention, normal lace. Aroma of chocolate, red fruits, a bit smokey, malts. Full body, viscose texture, normal carbonation. Sweet finish. Taste of chocolate, coffee notes, red fruits, caramel and a bit smokey too. 0.5l serving in a custom branded glass -- basically weissebier style, but with a handle. A pitch black beer with a clumpy tan cream head -- plenty of stick and good retention. Aroma was more or less clean, with a touch of buttery diacetyl poking through. Fairly malty, earthy, with hints of caramel and a background char flavour. Light on the malt sweetness. Hops lend a touch of sour to the mix and aid in creating a semi-astringent flavour. Had this at "Conmux" in East Berlin, but also throughout Berlin at various bars and cafes. It's without a doubt one of the more popular Schwarzbiers available in Berlin, and one of the most tasty. It was so nice to see this hard to find and underrated style. Highly drinkable. Highly recommened. Presentation: 12 oz brown long neck bottle, no freshness date but there is a description of the beer at the neck of the bottle. Appearance: A bit rocky in the head department with a lovely lacing effect down the glass. A couple of shades lighter than pitch black. Smell: Slight roasted and sweet malty aroma, smells of creamed coffee in a faintly sweet way. Quite clean also. Taste: High smoothness with a deep medium level carbonation, hints of dark bread like a pumpernickel or whole grain is layered thick on the taste buds. Hop bitterness is mild with a bitterness that holds its own for balancing the beer. Mild roasted malt character with hints of carob, chicory and bread crust. Malt sweetness is there but stay to a minimum and does not go to a cloying level at all. Alcohol is meek and barely noticeable, slightly dry finish is doused with a clean graininess and hints of spicy hop. Notes: I like this beer a lot, not just because this is one of my favourite style but because it keeps it real with flavours that are a bit complex yet not to the point of taking away from actually putting one down if not a few. A damn good pick for the style. AWEEEEEEEEEESOME! My favorite style of beer for sure. The only other Schwarzbier I've had is black forest by Saranac, and this is better in all areas - and that is a great beer. Was really lucky to find a four pack of this for $5.99!!! Köstritzer Schwarzbierbrauerei GmbH & Co. "Köstritzer Schwarzbier"
Notes via stream of consciousness: Another beer that's slipped away from. I've had Köstritzer Schwarzbier many times before, however, at least this time I know I've got a fresh example. It's black in the glass beneath a frothy head of tan that seems to be holding quite well, and it's left some very nice lacing where it's already dropped. When held to the light you can see that it's actually a clear, dark, ruby-accented mahogany brown. The aroma expresses dark caramel and the suggestion of dark chocolate and roastiness. The same is true of the flavor and it's very interesting. The caramel is clearly there but the chocolate and roastiness are almost like ghosts. It's certainly unique as there's nothing that really comes close to it, not dark milds or porters or stouts. It's mildly bitter and there's just a kiss of noble hops in there. For such a dark beer it's really subtle across the board, and therein lies it's greatness - it's very accessible and easy to drink while at the same time delivering enough delightfully dark and just lightly sweetish caramel that you keep wanting to go back for another sip. It's a balancing act, and a magic trick as well because although you've got some nice, dark, sweetish malt upfront it then magically disappears in the finish with only a reminder and that ghostly roastiness lingering. Most of the schwarzbiers I've tasted, particularly American made versions, go too heavy - it's a dark lager, just one that has a little bit more character than say, Heineken Dark. It's really a classic of the style, and so keep in mind that that's how I'm rating it, against what could be the "perfect" schwarzbier, not agains all of the other beers of the world. Well worth trying! T: chocolate ... so dark-malty sweet; some slightly toasted oak wood, far from burnt but there's a little char-wood taste; as the palate adjusts, a nice earthy flavor offers a little balance to the big sweet malt flavor; the back-end wood flavor is like a great jazz drummer, always right on time; boy, that chocolate sweetness is for real ... it shows up in a big way at times and always right up front, leading off a swallow and perfectly setting up that woody/earthy aftertaste ... what a beer! O: this beer is so good; plenty of dark-malt flavors including chocolate and that nicely toasted wood, some balancing earthiness, and the mouthfeel makes me want to drink more and more and more ... I will buy this beer almost as often as I can find it and drink it year-round, for any and all weather and occasion; I've been looking for the ultimate dark-malt session brew, and this is it. Kostritzer is black. Light black, if that makes any sense, with a matte finish. While sitting under the light it shows off some faint garnet highlights along the edges of the glass. The mocha head is ultimately creamy and jumps to two fingers in height on a gentle pour. The foam eventually fades to a crown but never disappears and leaves behind handsome peak & valley lacing. The nose on this beer is where it's at. A soft, approachable roast gets it going. Brown bread and faint licorice pop up in the middle. Mild hazelnut. This fresh can produces a nice, solid earthy hop profile that tends to fade with the older examples. The nose fades to only roast but a quick swirl of the glass really opens it back up. The flavor doesn't quite have the depth that the nose seems to but it is still delicious. Those gently roasted malts get things started and push all the way through to the finish with a soft sweetness. That hazelnut runs through the middle again while the brown bread and faint licorice round it all out and add some complexity. There's a complimentary earthy hoppiness that lingers long after the swallow. This beer is as clean as it gets and very well rounded. Kostritzer is made to be drank, and drank a lot, so the mouthfeel and consistency are very important. A moderate weight with lively carbonation keeps this beer moving quick. The bubbles leave behind some tingle along with the mildest of bitterness. A half liter of this can disappear awfully fast. Incredibly easy to drink. Kostritzer is one hell of a beer. One I have been especially fond of since I was a wee lad. It's well rounded with a nice layering of flavors and it's incredibly easy to drink and enjoy. The price point is also hard to beat. Kostritzer has it all. Found covered six-packs of this old import favorite at a local grocer. Six-pack box (and bottle label) says I have 12 days to drink these (06.18.2013) -- let's get at it! An old favorite import from the pre Microboom® days -- haven't sampled it in a while. A -- Inky black in color with a dense tan head that holds up well, slowly settling to a firm cap. A flash shined thru my .33L Willi Becker shows ruby highlights, but very opaque. S -- Aroma is fresh DMS and mild roasted malt with a vague hint of caramel. Pretty light in this category. T -- Roasted malt character with dark, baking chocolate undertones. Some mild bready notes try to balance the roasted malts with some very light hop spiciness. The finish is all roasted malt, though the bitterness in the finish and aftertaste isn't easy to dissect between hops and highly kilned malts. M -- Smooth, soft mouthfeel with a dry finish. Light medium body. O -- This is the king of Schwarzbier. A lager to present to the naysayers who think lagers have no character -- and at such a mild ABV too. As roasty as some Porters and Stouts, but with the clean finish that can only be the result of bottom fermentation and long, cool storage. Poured into flute glass. Not much head if poured slowly, fizzes down to narrow, faint rim. Nice roasted character. Not overly complex, but very pleasing. Chocolate, rye toast. For lovers of Dunkel Lager, Dry Irish Stouts, Porters, Old Ale, rye lager, and, of course schwarzbier. The sum of the parts here put this in league with great, simple, low ABV dry stouts. a) Stout like pour with thinner, less lasting head but equal masculine body and lace. s) Too faint since a lager. Sports roasty aromas of coffee, bitter dark chocolate, candied plums, raisins, and roast marshmallows. t) Again the candy, offering more depth in all the flavor above, but tempered with roast, a bit of char, and a soy/salt/woody counter balance. f) Light bodied, low carbonation, best at cask temp, touch of creamy, with a roast and fire wood dryness. o) Recommended for dessert, esp when low ABV and weight is desired. 16.9 oz can, packaged on 6/24/17, best before 6/24/18. Very dark brown, almost black, with a big, creamy, light tan head. Patchy lacing on the glass. Roasted malt aroma that had a bit of a soapiness to it, which was kind of odd. It wasn't overpowering though so it didn't detract from the beer. Clean chocolate and roasted malt flavor. Bitter finish that is more the result of the roasted malt than the hops. Medium bodied. A straightforward, easy drinking, dark German Bier. Moderate pour yields a one inch plus light tan head over a dark brown body with some nice lacing. Nose roasted malt a bit of earthiness, dark bread, and some chocolate. Flavor is very nice, roasty, chocolate, dark bread (pumpernickel.) Nice feel and overall an easy drinking dark beer and refreshing as well. Cheers! I'm trying this beer at Haxnbauer in Shanghai. It poured a nearly opaque dark with off white head that is leaving a spotty lace. The scent some roast. The taste was nicely balanced and easy to drink. Hints of chocolate and roast make the beer. The mouthfeel was medium in body with smooth carbonation. Overall it's a solid beer. Deep brown hue capped with a dingy white, rough and rocky head. This fades into a layer of foam that consistently lingers on the surface of the brew and leaves light lacing. Toasted malts predominate the aroma with a delightfully light hint of noble hops. Not noticeable at first, the hops plays well with the malt. Flavor mostly toasted dark bread and chocolate malts quickly finished by a lightly roasted but clean finish. Perhaps a little sourness on the finish, but this is only a slight detraction. A little more malt would perhaps clean it up. Not a big problem. Mouthfeel a little on the light side, which blows me away when I think of the roasted malts that must have gone into this for it's color and flavor. Classically, this captures what I most often think about when I think lager. Amazingly crisp finish without harsh bitterness. Exceptionally and dangerously easy to drink. An easily quaffed beer, drinkable anytime, anyplace. Purchased at South Bay Liquor. Poured from a 12oz. bottle into a pilsner glass. Dark with a moderate head that dissipates quickly. Aroma of honey and malt, with a little chocolate underneath. Tastes very much how it smells. Honey, malt, and chocolate. Finishes with a nice sweetness that isn't cloying. Mouthfeel is creamy. Not a very complex beer, but certainly enjoyable to drink. This brew produces a thick richly textured, light and tan head, with a near pitch black full body appearance. There are slight reddish hues visible on the border of my pint glass. Aromas that I notice are coincident of caramel as well as a rye bread tone. The taste is very bready as well, perhaps a dark style such as rye or laugen. This brew is very drinkable for a full bodied brew and slightly on the lighter side. This is a good session beer as well as a heavier thirst quencher. 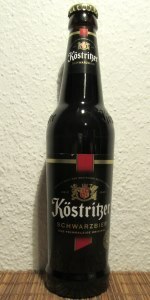 Schwarzbier from Köstritzer Schwarzbierbrauerei GmbH & Co.